Back to regular broadcasting now but not before I say that I truly appreciate every single response to my last post here. I was so overwhelmed with support and love from people far and wide, and it meant a lot to me. I will not be posting on the issue again, as I believe I've covered everything that needs to be said. If it comes up in my life again in the future, I'll just refer people on to that post. THANK YOU LOVELY, WHEREVER YOU ARE! I'm almost there with the content for my book. Almost. Well, I'm certainly closer than I've ever been before... I think I'll have all the work done by the 31st, which is so soon, and hopefully I'll be able to chill out over Easter. Like, I'll still have work to do in putting it together with the book designer, but all the drawings and writing will be done. Consequently I've been spending a lot of time in my studio, working away, but also making sure to take time out. Funnily enough, I've worked out that the less time I give myself to work, the more work I get done. If I use every single day I have spare in the studio I take the time for granted and seem to work at a slower pace I guess. Hmpf. The baffling ways in which my productivity thrives. Needless to say the large majority of the photos above were taken in my studio (was I really doing that much work?) 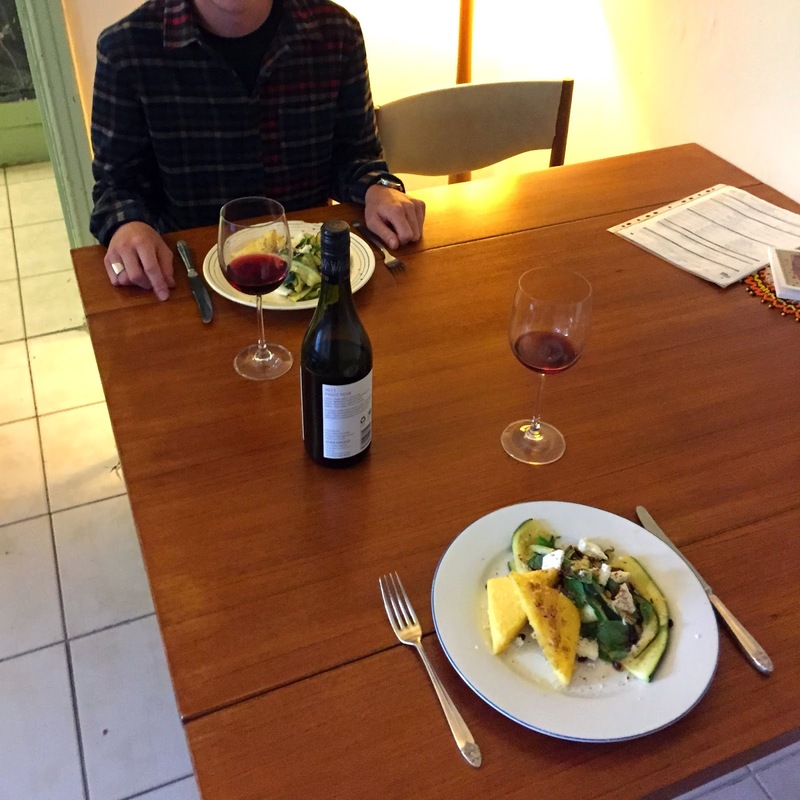 I had S over for dinner and set up a little table for two, it was very fun and made me consider a career in some sort of quaint 1960s Italian Restaurant set dressing. I cooked a rather strange stir fry which once again put my culinary skills to shame, it wasn't bad but you know, I just can never seem to cook up something amazing that people tell tales to their friends about! At another point last week I also had dinner with my VCA friends which I enjoyed vastly. We hadn't all gotten together in a long time, and it was typically boisterous with everyone talking over the top of each other at volumes louder than necessary. They're great people, and it's always great when we all get together because you remember that there's a certain sacred bond between those who've been through art school together... My friend G turned up late with a box of half eaten pizza and it was brilliant. S cooked me an incredible, restaurant quality dinner on Saturday night before we went to Dr. Morse for a friend's birthday drinks. I supplied the wine. I had to go into the store and talk to the person and buy it and everything, phew. Anyway Dr. Morse was so packed out, I had never been there before and certainly did not expect the kind of crowd they pulled - especially for being so far from the CBD and even from Smith Street. We had a bit of dance and I stayed on the Pinot which made for what I like to call 'wine eyes' which happens when you drink too much wine and your eyes are all droopy and slow-blinking. Wine eyes can occasionally turn into 'wine body' which is much less appealing so luckily we got a taxi home before that occurred. On Sunday night I went to the Romance Was Born 'Bush Magic' runway show as a part of the Virgin Australia Melbourne Fashion Festival. It completely blew me away. I had never seen a live runway show of theirs, so being privy to this spectacle (in the FRONT ROW no less guys!) really solidified the respect I have for Anna and Luke as designers. It was at the National Gallery of Victoria in the great hall there. The lighting was purple hued and a scent of eucalyptus was apparent as you walked in. Sounds of lyrebirds and kookaburras echoed off of the beautiful stained glass roof, and the runway was lined generously with paper cut outs of gum leaves and gum nuts. The models walked out of a ramshackle looking timber bush shack, flanked by ballet dancers in gum nut baby costumes and even more remarkable costumes of a koala, a cockatoo, a kookaburra and even a 'Big Bad Banksia Man'. The music was perfectly vague - xylophone versions of classic 'Aus Rock' songs - my favourite was 'I Am Woman' at the very beginning. I wrote on Instagram that Luke and Anna get it right every time, and that I am continuously blown away by the intricacy in their themes, that are always executed impeccably. At 12am last night I was still buzzing from it, at 10.48pm tonight I'm STILL buzzing from it! It was just beautiful, and an experience I will have with me for a long time. I really have never felt that way about a runway show before, I've seen a few, but they're always been so stark and lacking in heart and parading dry concepts (okay so I haven't seen too many high end runway shows but..) This was just amazing. I didn't want it to end. I haven't been to a runway show in a long time. I miss it.